SPRINGFIELD, Mo. 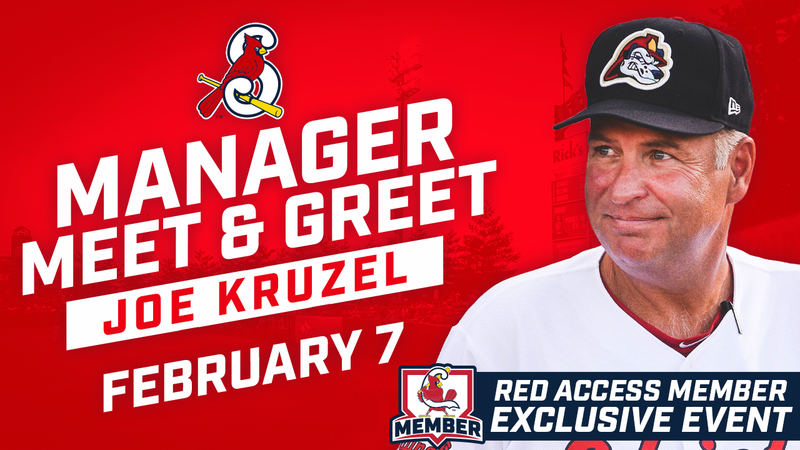 -- The Springfield Cardinals are excited to host a special meet-and-greet with new manager Joe Kruzel on Thursday, February 7 for all RED Access Members. The event--taking place in the Cardinals Indoor Training Facility at Hammons Field--will run from 5-6 pm with Kruzel's official introduction to Cardinals fans scheduled for 5:15 pm. While this event is reserved for RED Access Members, anyone who signs up for a membership between now and the day of the event are also invited to attend. There will be drink specials and free popcorn for those in attendance. Gates open at 4:45pm. Kruzel was named manager of the Springfield Cardinals on January 18, 2019. He has a mark of 369-340 in seven seasons as a Minor League manager, including six managerial seasons with the Cardinals and one with the Reds. For more information on the event, please call our Front Office at 417-863-0395. RED Access Memberships have replaced and greatly improved upon Season Ticket Plans. If you're not a RED Access Member, now's a great time to join the movement. Starting at just $95, RED Access Memberships are the most innovative and fan-centric ticket plans in Springfield Cardinals history and is the first membership program of its kind in Minor League Baseball. Some of the main RED Access Membership perks include seats to at least two games per month, a G.A. Access Card that gets you in to all 70 home games and can be used whenever you'd like, completely open pre- and post-ticket exchanges, new Flex Pay options for ultimate affordability and much, much more. For all of the information about RED Access Memberships and to sign up online right now, click here. The 2019 season marks Kruzel's 12th season in the Cardinals organization. Kruzel's teams have finished with winning records in six of his eight managerial campaigns. He also spent five seasons (2008-12) as hitting coach for the Cardinals' Class-A affiliate in Quad Cities. Kruzel came to the Cardinals after spending the 2006 and 2007 seasons with the Reds organization. In 2006, he was the hitting coach for the Gulf Coast League Reds before moving on to the manager position at Billings (R) in 2007. He previously spent 15 seasons (1989-2003) at the University of Toledo, where he served as assistant baseball coach from 1989-92 before moving on to head coach from 1993-2003. Kruzel was named Mid-American Conference Coach of the Year in 1999. In addition to coaching, Kruzel played second base at Toledo from 1985-1988. Kruzel resides in Hamilton, Ohio with his wife, Amy, and three children, A.J. (25), Jaime (22) and Abby (20). A.J. was drafted by the Cardinals in the 37th round of the 2013 draft, but did not sign.